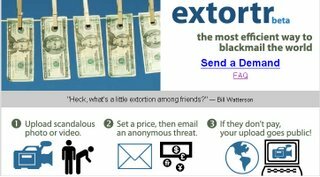 Living Online: Extortr:Blackmail Service ? Extortr is a website which base-on Kyrgyzstan. It helps people use blackmail to get money ( send someone email with scandal picture for ask money ). I think that is illegal in most countries, but Extortr says it is a business in Kyrgyzstan. It will take a 10% cut of the amount paid, with a $5 minimum. Does it a joke?